Being taught by a great teacher is one of the great privileges of life. Teach Now! is an exciting new series that opens up the secrets of great teachers and, step-by-step, helps trainees to build the skills and confidence they need to become first-rate classroom practitioners. 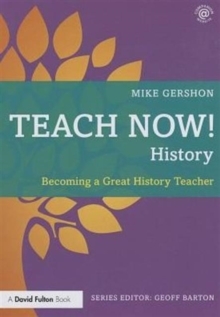 Written by a highly-skilled practitioner, this practical, classroom-focused guide contains all the support you need to become a great history teacher who inspires and motivates students to critically and creatively explore the past. Combining a grounded, modern rationale for learning and teaching with highly practical training approaches rooted in the realities of the classroom, the book guides you through all the different aspects of history teaching offering clear, straightforward advice on classroom practice, lesson planning and working in schools. Teaching and learning, planning, assessment and behaviour management are all covered in detail, with a host of carefully chosen examples used to demonstrate good practice and show how to facilitate outstanding historical enquiry. There are also chapters on dealing with pressure, excelling in observations, finding the right job and succeeding at interview. Throughout the book, there is a great selection of ready-to-use activities, strategies and techniques which will help put you on the fast track to success in the classroom; and ensure your students are doing the very best learning possible. Covering everything you need to know, this book is your essential guide as you start your exciting and rewarding career as an outstanding history teacher.